We’ve seen a lot of great musical products over the last few years, especially with the rise of crowdfunding. One common theme recently has been the pain associated with creative guitar players and standard effects modules. The age of the stomp box may be coming to an end. Guitar players don’t want to be grounded and connected to wires, or one spot on the floor. That’s one of the reasons Mike Carparelli and the team at Carparelli guitars created the Carparelli Infiniti S.
Carparelli has been around for over a decade. Although they are much smaller than say Fender or Gibson, Carparelli has been known for their superior craftsmanship and their commitment to the artist rather than the bottom line. That’s another reason that Carparelli created the Infiniti S.
The Carparelli Infiniti S is the first guitar in the world that’s integrated with it’s own effects unit built into the guitar giving the guitar player unprecedented freedom. Imagine all of this, just built into the guitar. The guitar player, playing the Carparelli Infiniti S doesn’t need to have an array of stomp box effects pedals, a drum machine, or a metronome, all of that is in the guitar itself. The Infiniti S allows users to create music in a self contained environment and without the help of others. Then, they turn it around and make it a breeze to collaborate by linking multiple Caprarelli Infiniti S guitars together. One of the best parts about the Infiniti S is that the integrated electronics include a headphone pre-amp that allows the guitar player to practice anywhere, anytime they want. The headphone out allows the guitar player to plug their guitar into any device that accepts a standard headphone or “aux” cord, meaning that guitar players can even play the Carparelli Infiniti S in the car. Carparelli has partnered with Zoom to create the Infiniti S. “The standard ZOOM stomp box style interface has been reduced to fit on the upper bout of your instrument and a single toggle switch is added to the control area of the guitar. This allows for easy adjustment/setup with convenient changing between sounds/patches during play. With convenient 1/8 input and output you can play to recorded backing tracks from any mp3 capable device and listen to yourself playing through any headset or earbuds. 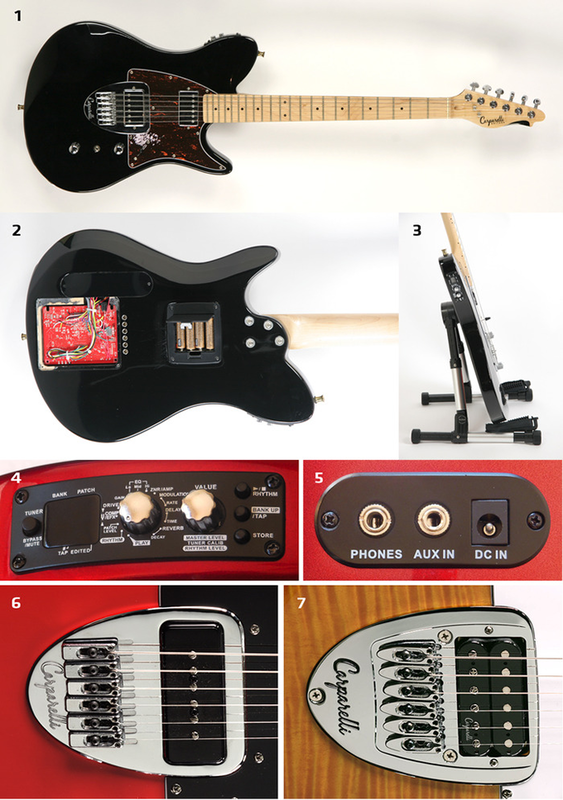 And, you can always bypass the ZOOM simply by engaging the push/pull control knob to go old school.” Carparelli said. The possibilities with this guitar are truly endless. The best part, the Carparelli Infiniti S doesn’t cost $3,000 or even $1500 dollars. It’s available for pre-order on Kickstarter.com for just $599.